1 Cheat Menu On the screen where you can choose to START or change options, press DOWN, UP, LEFT, LEFT, A, RIGHT, DOWN. A new menu choice, "Cheat Enabled," should appear. Here are descriptions of each item on this menu. 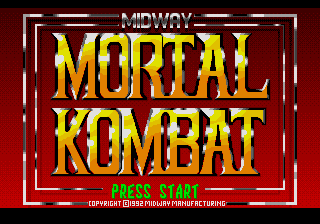 PLAYER ONE Chooses who is on the left in the scrolling side bar, the medal display, and the "Test Your Might" screen. 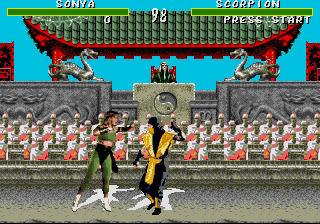 PLAYER TWO Chooses who is on the right in the scrolling side bar, the medal display, and the "Test Your Might" screen. PLAN BASE Select from four orders in which your character will fight other characters. You can pick a set order or choose "Random" which allows the computer to choose one for you. This takes effect for the game and for the demo. MATERIAL Picks the material for the "Test Your Might" screen. CHOP 1/2 Picks the number of rounds between each "Test Your Might" screen. Takes effect in one-player mode. Enter 0 to disable "Test Your Might". DEMO Demonstrates different parts of the game. CAMEO Displays background information on PLAYER ONE. PLAN BASE Displays the plan base as selected in PLAN BASE. BIOGRAPHY 1/2Displays biography screens for PLAYER ONE. MEDAL Shows the winning screen after you beat someone in two-player mode showing PLAYER ONE as having 20 consecutive wins vs. PLAYER TWO. CHOP-CHOP Brings up PLAYER ONE vs. PLAYER TWO in the "Test Your Might Screen," chopping the material selected above. FLAG 0 Brings the right player's energy to DANGER at beginning of the round. If Reptile appears, the player has full strength for the first match. During endurance matches, the second opponent has full strength. FLAG 1 Brings the left player's energy to DANGER at beginning of round. If Reptile appears, the player has full strength for the first match. During endurance matches, the second opponent has full strength. FLAG 2 Guarantees shadow appearances on the Pit Stages. FLAG 3 Changes shadows on the moon to a face or the initials "BYC". Works when the sound, music, and effects test are not all set to 1. FLAG 4 Reptile appears with hints at the START of each stage. FLAG 5 Infinite continues (credits never decrease). FLAG 6 The computer will use fatalities. FLAG 7 Locks background screen as "The Courtyard" until the fight before Goro. BLOOD CODE Turns blood on and off just like ABACABB. CHEAT CODE Turns off all cheats and clears all flags (FLAG 1, 2, ...) If the cheat menu is exited with CHEAT CODE off, the Cheat Enabled choice disappears from the menu. FIRST BACKGROUND Chooses which background appears first. 2 Hidden Enemy To fight a hidden character, do this trick: Enter the master code, go to the option screen and turn Plan Base to three (3), turn flags 0, 2, and 3 on, and make the 1st map on the Pit. Fight up to the second Endurance Match. Defeat both opponets flawlessly (without blocking) and you will go to the Pit and fight Reptile. After defeating him, a new fighter will appear. If the 2nd Endurance isn't at the Pit, keep losing until the stage is the Pit, and a new fighter will appear. 3 Blood Code From the Code of Honor screen, press A, B, A, C, A, B, B. 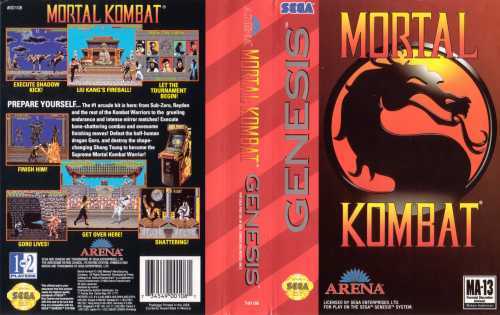 If this was done correctly, the code of honor fonts will turn yellow and you will hear Scorpion say "Get over here!" 4 Guaranteed Reptile Fight Enable the Cheat Menu. Now go to the cheat menu and set FIRST BACKGROUND to "The Pit," FLAG 1 to ON, and FLAG 2 to ON. When you START, you're at the pit screen, and the moon shadows will always be there (you'll see Santa Claus, the witch, etc.) 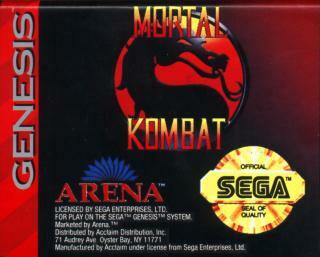 To guarantee a fight with Reptile, never block, get a double flawless, and do the fatality. Good luck!